Review: When Majestic Prince splashed down in the summer of 2013, barely a peep was heard from the broader anime fanbase. As a result, few people who weren’t already into mecha gave it a shot. Furthermore, Toshiyuki Watanabe, though notable for his work on Space Brothers, doesn’t galvanize an anime music fan to watch the anime in the same way someone with the pedigree of a Yoko Kanno, Toshihiko Sahashi, or an Akira Senju would. 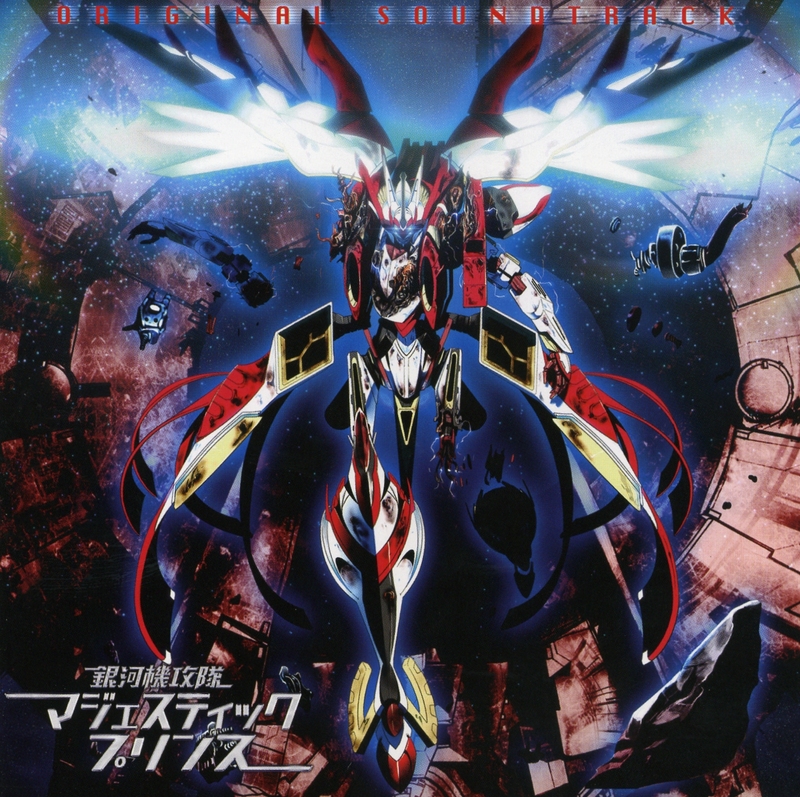 But to miss out entirely on Majestic Prince’s soundtrack would be a mistake; Watanabe solidifies his reputation, releasing a consistent, even exemplary score that succeeds in balancing the intensity of the action tracks typical of the mecha genre with the multitude of quieter fare suitable for the myriad of emotions the anime evokes. On first glance, Majestic Prince sounds like yet another in-your-face action soundtrack. The first few pieces carry that heavy-handed approach, starting with “Wulgaru Army’s” moody introduction that leads a distraught chorus and accompaniment to weave a ponderous atmosphere evoking widespread death and destruction. With its harsh, dissonant accents, “Wulgaru Army” lacks nuance, and as a result, offers little wiggle room for interpretation as it firmly spells out the extent of the carnage. The music continues to intensify in “Initial Flight,” where the brass fanfare and strings move at such a hurried pace that it feels altogether too eager and excitable to be enjoyable. Although they may succeed at drawing listeners’ attention into the middle of the action, their execution borders on being exhausting, especially if their impetuous energy had turned out to be more ubiquitous. Thankfully, that’s not the case. Further in, the helter-skelter nature of what’s come previously subsides, and more enjoyable fare like “AHSMB” materialize. In “AHSMB,” the tempo takes on a slower, more measured tack, carrying with it an aura of dignity that morphs into a lofty, hopeful air more pleasing to the ear. And when that performance is followed by “Activation of Fate,” you can hear the atmosphere slowly stirring and coming into its own, building its magnificence little by little. The theme it refines gets a short nudge, then becomes truly majestic in “Sortie Preparation” as the swelling strings radiate confidence, imbuing it all with a sense of purpose. The only other piece to top it in terms of gloriousness is “Reinforcements,” which unleashes a trumpet delivering a paean, celebrating heroism in a grand, no-holds barred bombastic manner. Though these exultant tracks are highlights, Majestic Prince’s villainous themes and martial tones do enough to evoke a sense of danger competently without overstaying their welcome. In villainy, we have “Wulgaru Army Invasion,” which, though cliched with its ominous atmosphere sculpted by dramatic choruses, strings, and brass, is still bearable. In terms of martial tones, we have “GDF Headquarters” to amp the tension, followed by “Do-or-Die Spirit” which takes one of the recurring motifs and sets it to a grim, deliberate rhythm to evoke a sense of danger and hopelessness. But while these and other tracks like “Damage” carry the requisite energy, chaos, and urgency that one would expect out of an action track, they are, relatively speaking, some of the less interesting pieces that Watanabe serves up. No, Watanabe’s strength, as it was in Space Brothers, lies in the soulful, heartwarming fare. Of those, “Consultation” is brilliant in its heartfelt transition from slight uncertainty to restrained starry-eyed optimism, fusing much warmth and love into the piece, then channeling them wonderfully. The mood stays its course in the next track, “Graduation” where the woodwinds propel the piece with a yearning, nostalgic tone that nevertheless packs a hopeful outlook. Not to be outdone, “Hope” echoes that optimism, conveying those feelings most passionately during the string swells which are so uplifting that the weight of any troubles or concerns simply evaporate, allowing that better future to take hold. As Majestic Prince closes out, it does so with pieces like “Gratitude” and “Anxiety” which quietly radiate their charm (the latter of which even carries a hint of Chihayafuru’s soundtrack through the woodwinds) while providing a definite sense of closure that feels most satisfying. For a soundtrack that doesn’t initially impress by being uncomfortably in-your-face in the opening tracks, I was pleased not only by the transition from the brash, intense tracks to the more nuanced pieces, but also by how seamless it all was. As little recognition as Majestic Prince may garner from the broader anime fanbase, the score is a treat, standing strongly on its own as its sheer consistency sets a very good baseline by which mecha anime scores are to be judged. It was bothering me so I translated the tracklist. I pre-ordered the soundtrack to get hold of “Respect Me” by Chiaki Ishikawa, and enjoyed the whole soundtrack album. I’d also bought the CD singles of the first OP and ED of the Ginga Kikoutai Majestic Prince anime by Natsumi Kon and Chiaki Ishikawa. PS, my previous not-quite-soundtrack of anime purchase was “Another Sound of 009 Re:Cyborg” (tracks not used in the actual movie). Do you intend on reviewing the Gundam Build Fighters OST by Yuki Hayashi? I’ve been hearing about it a lot over Twitter. I guess after I clear out Hisaishi, that one will be next.